Downhill mountain biking (DH) is a genre of mountain biking practiced on steep, rough terrain that often features jumps, drops, rock gardens and other obstacles. Downhill bikes are heavier and stronger than other mountain bikes and feature front and rear suspension with over 8 inches (20 cm) of travel, to glide quickly over rocks and tree roots. In competitive races, a continuous course is defined on each side by a strip of tape. Depending on the format, riders have a single or double attempt to reach the finish line as fast as possible, while remaining between the two tapes designating the course. Riders must choose their line by compromising between the shortest possible line and the line that can be traveled at the highest speed. If a rider leaves the course by crossing or breaking the tape they must return to the course at the point of exit, unless they do not gain a time advantage from crossing the tape, in which case they can continue with their run. Riders start at intervals, often seeded from slowest to fastest. Courses typically take two to five minutes to complete and winning margins are often less than a second. Riders are timed with equipment similar to that used in downhill skiing. Many ski areas are converted into biking venues in the summer (such as Whistler Mountain Bike Park and Fernie Alpine Resort) however there are also many other hills with Downhill Mountain Bike trails built on them. Bikers ride gondolas, trams or chair lifts to the starting point at the top of the mountains. Another method commonly referred to as “Shuttling”, uses motorized vehicles to transport multiple riders to the top of the hill. Normally utility vehicles or 4WD’s are driven up off-road tracks to the top of the courses. However, some tracks provide access to ordinary cars – such as Kuranda Downhill in Cairns, which runs down the Smithfield side of the Macalister Range and uses the road as access. Courses used in competition typically feature several “lines” through or around the most difficult obstacles. For example, the “A line” might be a very direct line with a large jump landing on rocks, the “B line” might be a smaller jump with a clear landing, and the “C line” might completely avoid the obstacles, but be much longer. 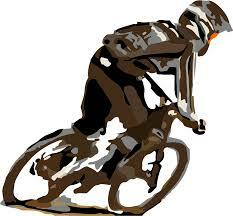 The Union Cycliste Internationale is governing body for downhill mountain bike racing. Racers qualify to compete in World Cup races by earning UCI points, which are gained by being a top ten finisher in certain races, usually national. In the U.S., NORBA, as part of USA Cycling, runs the National Mountain Bike Series, and the NCCA is the governing body for collegiate cycling. 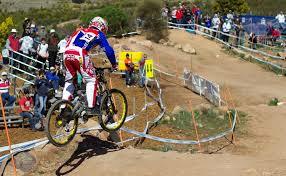 In the UK, British Cycling controls mountain biking as well as road and BMX. In Australia, MTBA controls all disciplines of Mountain biking.